In a world where everybody's hair is uniquely different in characteristics, we source hair from different regions of the world to find various textures and styles to suit everyones specific hair type and needs. We provide budget friendly hair options as well as supreme high-end options for longer lasting results. The smallest and most discrete extension on the market. Micro Weft lays flat to the head,and is even more slim than tape extensions while achieving outstanding fullness. Machine wefts are the oldest form of wefted extensions and can come in a variation of sizes. Our machine wefts are strategically double wefted so that maximum fullness is achieved per inch. Machine wefts are ideal for individuals with a medium to thicker hair density and are typically the most economically priced due to faster manufacturing. Clip in and go at your convenience! Clip ins are the perfect solution for instant length and volume to dress up any occasion! The Hybrid Weft is a hybrid between a Hand Tied Weft and a Machine Weft. Taking the best qualities of both and merging them into one new revolutionary weft to achieve an ultra flat lace weft attachment that caters to discreteness and comfort, with the flexibility to customize the density for fine or thick hair textures. When choosing hair best suited for you, it is important to get hair that matches your hair's natural texture when it air dries. This way if weather conditions, humidity, or lazy days come about, the extension hair will react in the same manner as your own. This not only give an undetectably natural appearance, it is lower maintenance! Hair Boss Hair is carefully sourced to provide an above market quality with every detail of manufacturing taken into account to upkeep our quality standards. Our Hair is cut from single donors which are hand picked by experts who select the healthiest bundles of unprocessed virgin hair. To obtain a thicker density, short pieces of hair are removed and 1-3 bundles are consolidated to achieve more fullness, resulting in a 75% Double Drawn ratio. Our team takes careful measure to ensure that the hair direction stays aligned from top to bottom to provide a true "Remy" product. This is important because non remy hair can easily tangle from the friction of the cuticles facing different directions. Prior to coloring, our hair is soaked in a nourishing treatment for at least 24 hours. In small batches, our hair undergoes a gentle slow lightening process to remove the pigment from the hair while mindfully preserving a healthy cuticle. Light blondes take about 3 weeks to achieve to ensure we maintain the health and elasticity of the hair. 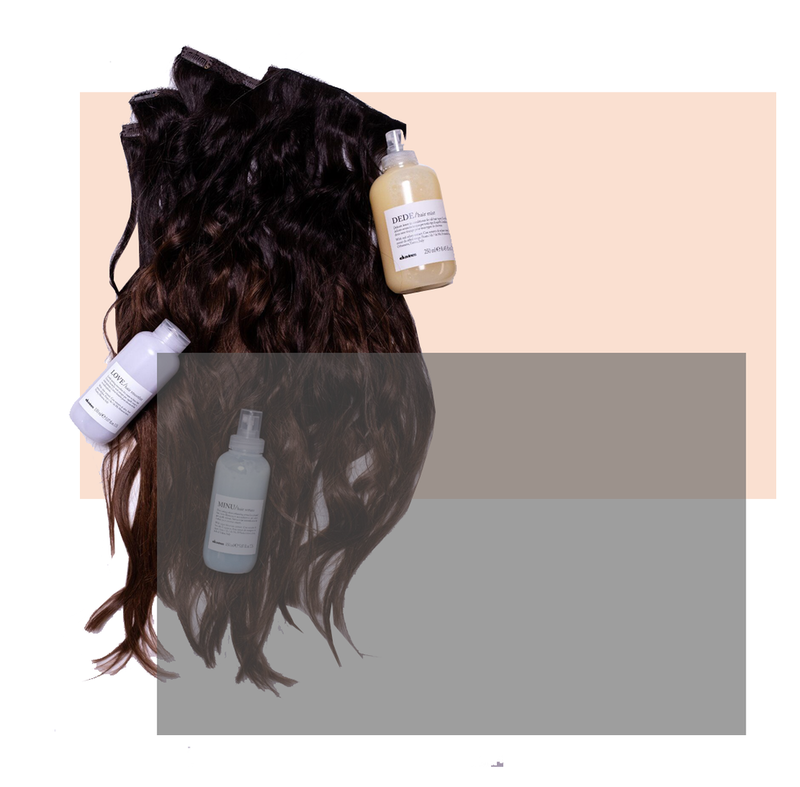 When the hair lightening is complete, the hair is conditioned prior to shipping. Our hair is silicone free! The natural shine and elasticity of our bundles reflects the true health of the hair. We keep the cuticle in tact so that the hair is receptive to absorbing the nourishment it needs through long wear time. A large amount hair bundles on the market are produced by collecting "fall hair" which can be swept from floors, collected from salons, or obtained from the unwanted gray or unhealthy hair bundles. These collectors sell the hair materials for cheap to manufacturers mostly in China. They take all of the collected hair materials and merge them together facing all different directions and put them into a machine that manually aligns the hair into the same direction. The machines only produces an 80-90% accuracy when aligning the hair. Since the hair comes from thousands of different donors, it requires chemicals to remove and strip the cuticle of the hair to give it a smooth appearance to avoid the cuticles from catching and tangling. They mass color process the hairs in large batches, often using fast procedures to lighten the hair which further damages the strands. They then coat the hair with silicone to be commercially appealing and allow the hair to feel healthy to the touch. The hair has a much shorter wear time, and may result in dryness and matting after 2 months of full time wear. This is artificial "Remy" Hair. Looks can be deceiving and often consumers are mislead when selecting hair that appears to be in good condition. After time the silicone coating wears off and the true nature of the hair is revealed. Wash with Davines Oi Shampoo & Conditioner 2x a week. Brush hair prior to washing. When washing, only shampoo at the root and allow the suds to rinse your extensions. Condition the entire extension including the base of the extensions for at least 2 min. Apply Davines Oi oil to damp hair prior to blow drying. Blow dry until completely dry. Naturally occurring frizz may result from a change in ions after blow drying. Allow 30 min for cuticles to settle. Use only ceramic styling tools for heat styling and when finished reapply Oi oil to replenish moisture..
Braid or bun hair before bed. Brush and reapply Oi Oil Daily. Avoid using too much product which includes leave in conditioner and hairspray. LEARN ALL ABOUT OUR SIGNATURE WEFT METHOD! Are you ready to join the great hair club?